Packed with north Moluccan endemics including the stunning Wallace’s Standardwing and Ivory-breasted Pitta. A trip to Halmahera is on many people’s wish list. Moluccan Scrubfowl; Dusky Scrubfowl; Moluccan Goshawk; Rufous-necked Sparrowhawk; Meyer’s Goshawk; Pygmy Eagle, Gurney’s Eagle; Bare-eyed Rail; Invisible Rail; Scarlet-breasted Fruit Dove; Blue-capped Fruit Dove; Grey-headed Fruit Dove; Moluccan Imperial Pigeon; Cinnamon-bellied Imperial Pigeon; White Cockatoo; Violet-necked Lory; Chattering Lory; Moluccan King Parrot; Moluccan Hanging Parrot; Moluccan Cuckoo; Goliath Coucal; Moluccan Scops Owl; Barking Owl; Halmahera Boobook; Moluccan Owlet-Nightjar; Halmahera Swiftlet; Blue-and-white Kingfisher; Sombre Kingfisher; Purple Dollarbird; Ivory-breasted Pitta; Red-bellied Pitta; Dusky Myzomela; White-streaked Friarbird; Dusky Friarbird; Moluccan Cuckooshrike; Halmahera Cuckooshrike; Rufous-bellied Triller; White-naped Monarch; Moluccan Monarch; Moluccan Flycatcher; Northern Golden Bulbul; Island Whistler; Halmahera Flowerpecker; Halmahera Oriole; Paradise-crow; Wallace’s Standardwing. The birding starts as soon as you leave Ternate: Depending on the weather, the time of year and the mode of transport you select, the sea crossing can be quite productive. Birds regularly seen on the crossing include Greater and Lesser Frigatebirds, Bulwer’s Petrel, Red-necked Phalarope and Aleutian Tern. You should also look out for the critically endangered Chinese Crested Tern that has been recorded off Halmahera once. The usually arrival point in Halmahera is the small coastal town of Sidangoli. There are a couple of nice birder-friendly guesthouses in the town, and a number of restaurants, plus the birding is excellent nearby, so this makes an obvious place to set up for a couple of days or more. Almost all of the endemic and regional-speciality birds of Halmahera have been seen around Sidangoli, although some are less likely, like Purple Roller and White-streaked Friarbird. The best birding areas near Sidangoli are on and off the main road heading inland. Leaving Sidangoli, this road first passes through a few kilometres of open farmland but soon after becomes lined with secondary forest and scrub. The road continues to rise until an obvious pass at around Km 12, and the habitat improves to become degraded forest on steep slopes. Many trails leave the road, some leading only a few hundred metres, other stretching off into the distance. Generally the further away from the main road you travel the more undisturbed and better condition the forest becomes. A dawn visit to the area around the pass should get you most of the more widespread endemics, plus a good chance of all the parrots. If you are lucky you might also spot a foraging Wallace’s Standardwing. The area just below the pass is also a pretty reliable spot for the difficult to see Scarlet-breasted Fruit Dove. 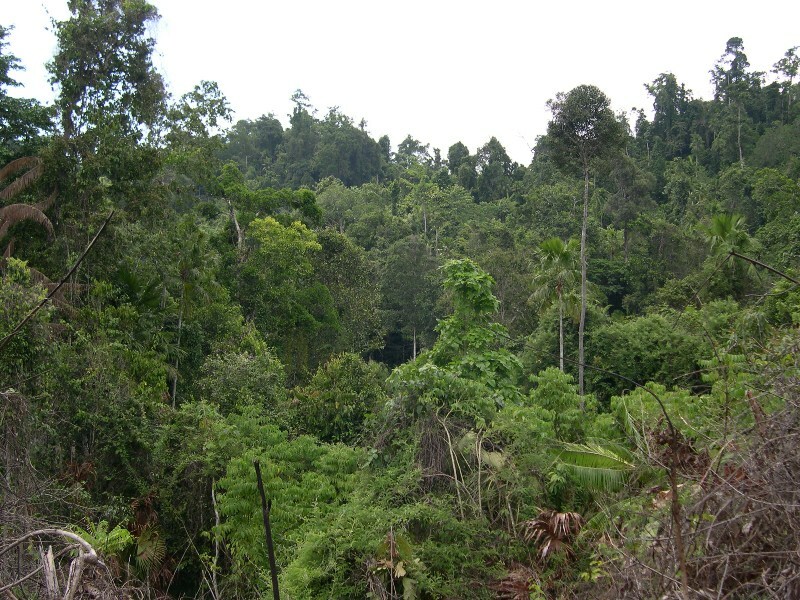 By night this same area holds Moluccan Scops Owl, Halmahera Boobook and Moluccan Owlet-Nightjar. An obvious side trail heads north about 500m below the pass, this passes first through secondary forest before heading down into dense undergrowth. This area is good for pittas, with both Ivory-breasted and Red-bellied Pitta present. Another spot worth a stop is back towards Sidangoli at around Km 10. Scanning from the road is again good for parrots and raptors, or following the track to the north takes you into better habitat, where most of the species above can be found, including the night birds. This is the vicinity of Anu’s house and the ‘original’ Standardwing lek. Most local guides know the location, and so can take you there, or you could try and find it yourself using the map below, but as you’d need to approach in the dark, this might not be advisable! By continuing to follow the ‘main’ track north several good forest patches are reached, and further north still the track rises into even better condition forest that is still relatively unexplored by birders. For those inclined, you could easily spend a few days exploring this area. The roadside scrub on the road back into town should be scanned for the impressive Goliath Coucal, and back in town you should explore around the mangrove areas for Beach Kingfisher (more easily seen from a small boat). Several other nearby areas can be easily reached on day trip from Sidangoli, or combined with moving location. These include the road towards Tobelo that passes through reasonable condition forest in a few places. Birds seen here include many of the same things as above, and also White-streaked Friarbird has been recorded. Another alternative is the road towards Sofifi, that forks away from the Tobelo road about 15 km beyond the pass. Following this road takes you through alternating clove plantations and occasional ridges of degraded forest. Purple Roller has been recorded on some of these forested ridges, and even the plantations are good for birds like Blue-and-White Kingfisher. Basically stop anywhere that looks interesting and explore! A regular on the birding circuit of Halmahera, Foli is usually reached by charter or public boat from the village of Daru across the bay on the Sidangoli-Tobelo road. A small losmen (hotel) in the village makes a convenient base for a stay. Stretching inland from Foli is a track that passes through a mix of open areas, degraded and reasonably intact forest on ridges. The road is not always passable by car or motorbike, so you may find yourself getting dropped a few kilometers in and then you are free to explore on foot. The usual areas visited include around Km 3 and around Km 17, but many trails leave the main track and are worth exploration. Many of the same birds as Sidangoli can be seen here, with perhaps a better chance of Purple Roller. Night-birding is also productive in this area, while Invisible Rail has been photographed at a small pond near Km 3. There are also usually known Standardwing leks in this area: Best ask at the losmen for the latest situation and let guys from there guide you to the spot pre-dawn. Further around the coast is the remote village of Labi Labi. This area used to be forested to the coast but now you will have to travel inland further to find good habitat, as logging has taken its toll. Birds are similar to the above, but potentially in less disturbed habitat (if you can find less disturbed habitat, that is!). Most people make the 3-4 hour trip along the north-east coast road for a chance of seeing egg-laying Moluccan Scrubfowl. These breed colonially on the black sand beach in the village of Simau, near Galela (north of Tobelo). By turning up at the village and asking to see the birds someone will normally arrange for you to accompany them to the site in the evening or early morning, where you have a chance of seeing birds in the dark on the beach. Be warned however; bird numbers have dropped massively in recent years and the locals can be pretty mercenary when it comes to prices. They are also pretty unhappy if you try and get to the area without a guide. The hills behind Tobelo (including Gunung Mamuya) can be worth exploration, with several tracks heading in and up. Follow any that look like they head towards forested ridges and the birding should be rewarding. From the village of Bina-Gara, on the parks northern border. This village is only around 1-2 hours drive from Sofifi, and basic accommodation can be arranged in the village. Locals here can then guide you to a large Standardwing lek only around 3km from the village, within the national park. The best bet to do this would be to walk the day before and camp at the basic shelter near the lek (and in the forest) and be there ready for dawn. The birding all around here should also be very good, with many of the birds mentioned above on offer, Invisible Rail already recorded, and more discoveries still waiting to be made. From the village of Tayawi, on the Tayawi River. Accessed by following the coast road south of Sofifi for around 2-3 hours, this very small village can provide very basic accommodation (think of it as camping!). From the village it around 2km to a known Standarwing lek, again with a simple camping shelter nearby. Birding is said to be excellent in this area, with the pitta, endemic pigeons and parrots and more recorded. From the village of Koli (Kobe). This is further afiled, and involves driving to the town on Weda, and then north (around 5 hours from Sofifi). You can arrange to stay in the village, or approach from accommodation in Weda. There is not a Standardwing lek known in this area, but the forests around are reportedly very good for birding, with many of the endemic species recorded. The site also has good access to some wetland areas. As you drive towards Weda, it is also worth stopping along the roadside as it passes through some excellent condition forest when it cuts across the island from the west coast towards Weda. For even more adventure keep heading east or south from Weda. The coastal strip is usually fairly degraded (but often still good for birding) but the hills behind the road contain some of the most remote and intact forests on Halmahera. Nowadays Weda Resort provides the easiest (and most expensive) birding on Halmahera. During 4 days it should be possible to see most of the endemics in the vicinity. The resort provides two local bird guides and all packages for birding (and diving) can be found on their website (see details below). Both guides (Danny and Bambang) have good knowledge of the whereabouts of all the birds. Birding starts right in the grounds of the resort itself. Grey-headed Fruit-Dove and Moluccan Flycatcher regularly nest near the restaurant. White Cockatoo, Paradise-crow and Blyth’s Hornbill regularly fly over the grounds of the lodge. Make sure you visit the walking track along mangroves at the east end of the grounds for Kamchatka Leaf Warbler in winter. The access road regularly hosts both Moluccan Scops-Owl and Moluccan Owlet-Nightjar. Moluccan Boobook is claimed here and in the vicinity, but this one of the few birds that is not likely to be seen when you spend all your nights on Halmahera at this resort. Close to the resort is a lek of Wallace’s Standardwing. The same forest hosts loads of other good birds and after a morning of birding here, your bird list should have grown considerably. Ivory-breasted Pitta is common here and expect birds like Halmahera Oriole, Rufous-bellied Whistler and Moluccan Goshawk. Birding is great anywhere along the road, both west of the resort (towards Weda) and east. The guides know several locations for Invisible Rail, but they can go unseen for weeks. If you have extra time, it might be worthwhile to visit the mountains east of the resort (3 hour drive, at an altitude of 1000m). The guides know the place and not many birders have been there yet. Pygmy Eagle is seen here and the local guides claim Dusky Friarbird. It is still a reliable for location for Chattering Lory and Moluccan KIng Parrot can only be seen here and not near the grounds of the lodge. Not many people make it this far, but if you were willing to try ask for info on boats when in Tobelo. If you make it to the island then at least nine endemic subspecies await, including ofVariable Goshawk, Chattering Lory, Moluccan Scops Owl, Paradise Kingfisher, Ivory-breasted Pitta, Dusky Myzomela, Cream-throated White-eye, Spangled Drongo and Paradise-crow; plus who knows what else…. Many birders visiting Halmahera opt to join an organised tour; either with an international group, or with one of the local companies (often Sulawesi-based) that offer tailor-made tours. 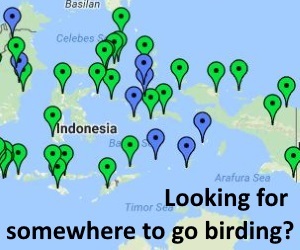 If you decide to try things on your own, however, it is not so hard; but remember this is fairly remote Indonesia (despite the amount of birders that come here) and so time, patience and some knowledge of Indonesian would be useful. Weda Resort is an exception this. The website http://www.wedaresort.com provides all the information you need and the place is excellent with good food (and good diving!). They can even pick you up from the airport in Ternate (ask to look for Beach Kingfisher and Azure Dolalrbird en route). They provide two local guides, Danny and Bambang. Aside from the Weda Resort, the usual route to Halmahera is by fast ferry (or charter boat) from Ternate. Public boats leave from Ternate town centre, from the area next door to the main mosque (quite impressive in itself). Boats from here go to both Sidangoli and Sofifi, so make sure you get the right one. They leave when uncomfortably full, and make the journey at rocket speed in about 1-2 hours. If staying in Sidangoli, then the Sidangoli Indah Hotel makes for a nice simple stay. The guys there will also be able to help you hire a car or motorbikes if you need them. Motorbike taxis are usually fine for birding the road above town, but you might want a car for longer excursions. There are also hotels of varying degrees in Tobelo, Sofifi and Weda, and the aforementioned losmen in Foli. Outside of these your best bet would be to report to the village head (Kepala Desa) and let them arrange for you to stay in someone’s house (if they don’t name a price in advance, you are still expected to offer something when you leave, so please do so). For boats across the bay (to Foli or Labi Labi) you may be able to get on irregular public boats, but more likely you will have to charter something. The sea can get pretty rough on the crossing, so don’t we tempted to hire the cheapest thing you can find; better to go for the most sea-worthy thing you can see and pay the few dollars extra! You may also want to arrange for a pick-up time, in case it doesn’t prove as easy to get a boat back. For access to Aketajawe-Lolobata National Park, including information on the villages mentioned, the best bet is contact the National Park office in Ternate (Jl. Bandara Sultan Babullah) or Sofifi (Jl. Trans Halmahera, Desa Barumadoe, Sofifi, Halmahera), Staff there should be able to assist with arrangements and permits, and help you find a suitable guide to show you the way. The park in Halmahera has been supported by the NGO Burung Indonesia for a number of years, so most staff will be pretty familiar with birds and birdwatching. As well as staying at the villages mentioned, they can also help arrange longer excursions into the interior of the park. For trips like this you will obviously need to pack accordingly, but they will help advise you on what you need. Scroll down the page for related information, including photos, comments, trip reports, guides and services, articles and news. If you can update this account, or find things have changed, please add your comments below to make it easier for the next person. Thanks! Last updated Feb 2014. The following blends information that was passed along to me with my own experience. Access from Ternate: First you need to cross the channel between Ternate and Sofifi. The public ferry departs from Bastiong-ferry jetty, but your best bet is the shared speedboats that depart (when full) from Kota Baru jetty, which is significantly closer to the airport. In Sofifi harbour, I immediately found an ojek to take me to the Aketajawe-Lolobata NP headquarters. There, various park staff helped me getting my (expensive) permit, contacted Roji in Binagara to let him know about my arrival so that he could pick me up at the roadside, and phoned car owners until they found one that was going my way the same afternoon (IDR50k per seat). I was very impressed & relieved as this was the part of the trip I was most worried about logistic-wise. In case you have to find a car by yourself the shared-taxi terminal is just by the ferry jetty in Sofifi. You can also try the large gas station where any car going out is likely to stop. Accommodation: In Binagara birders usually sleep on a mattress on the floor in Roji’s very simple house. This is part of the experience but certainly is not for everybody. Eni (Roji’s wife) cooks good meals and would certainly be happy to blend in any ingredients you’d bring along (bring enough for your party plus four or five other people). They do not have any fixed price for the many services they offer. Birds: There are four main areas to visit. Immediately behind Roji’s house you find a small, slow river with inundated forest. This is the habitat of the Invisible Rail which Roji has seen on occasion while taking a shower! Roji or his family can show you the best spots where to wait and hope that a rail will exit the impenetrable swamp vegetation. Second there is a trail into the park. About 3 hours in, there is a Standardwing lek where the park had Roji and a team build a canopy tower affording exceptional views of the birds. Add 1h30 and you reach a hilly area where Purple Dollarbird are found along the ridges (however expect subpar views since the birds are atop the trees and you are on the forest floor). All along the trail, Ivory-breasted Pitta is amazingly common (I had three birds in views minutes after playing a bout of tape!!). Also notable are flocks of Chattering Lories (this bird has been trapped out closer to the village), quite a few White Cockatoo, a range of fruit-doves (but not the hoped for Scarlet-breasted for me), Moluccan Goshawk, Halmahera Oriole and H. Cuckooshrike, Dusky Scrubfowl, North Moluccan Dwarf-KF, Common Paradise-KF, North Moluccan Golden-Whistler (or whatever they are called), and North Moluccan Spectacled-monarch (or whatever they are called). Third, the cultivated valley immediately around Roji’s house is good to spot doves, pigeons, lories, parrots, and hornbills in the end of the day, as well as Cream-throated WE, Halmahera Flowerpecker (stake out any berry-bearing tree and ask Roji for recent sightings), Moluccan Goshawk, Chestnut-bellied Triller, and more. The hornbills actually roost at night immediately behind the house. At night I heard Barking Owl but it does not respond to tape. More importantly, Roji had a very reliable and easy to reach spot for Moluccan Owlet-nightjar where I got super views on my second attempt. Fourth, Eni’s parents live in a house about 15 minutes away by motorcycle. The house is close to the shore (they are from a fishing community and also work in coconut groves). In the mangrove we quickly located Beach KF, Sombre KF (using tape), and had excellent views of Violet-necked Lories, and fleeting views of several individuals of something that looked like a Drab Whistler (in a very different habitat than expected though). The coconut grove produced good views of Red-flanked Lory. Go there at high tide (whoever is guiding you there should be able to tell you when that would be). Special sighting: Invisible Rail! I had three individuals crossing the track one after the other at about 17:15 going from the swamp into the forest presumably to feed and possibly as part of a daily routine. This is the track going from Roji’s house to the reservoir. I was about to post re Pak Roji at Binagara; see Guillaume has added much info. 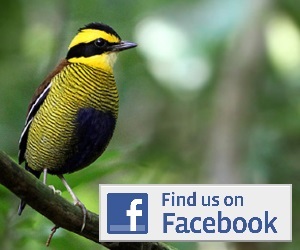 Pak Roji loves exploring forest; learned lots re birds, leading to also some consultancy work on Obi, and West Papua. Went to the mangrove area with him, too; don’t have to stay there, but good, tho a thick n gloppy mudflats walk for us before found Beach Kingfisher; fun outing. Top man; also great family to stay with. He’s lately built small guest house by his place; v simple, but to me superb location. He can also help with things like car w driver on Halmahera; and Ternate too if you wish. I’d think also Obi; we went to Bacan w Roji, too.